I have always looked at Morte Incandescente as the reincarnation of Les Legions Noires. The atmosphere, the Scent, the Aesthetic, but most importantly, the Feeling their music gives me. Drug addiction and Filthness; Death and Despair. Nocturnus Horrendus and Vultirius have been “digging” their grave for many years now, always resulting in exquisite pieces of Black Metal. 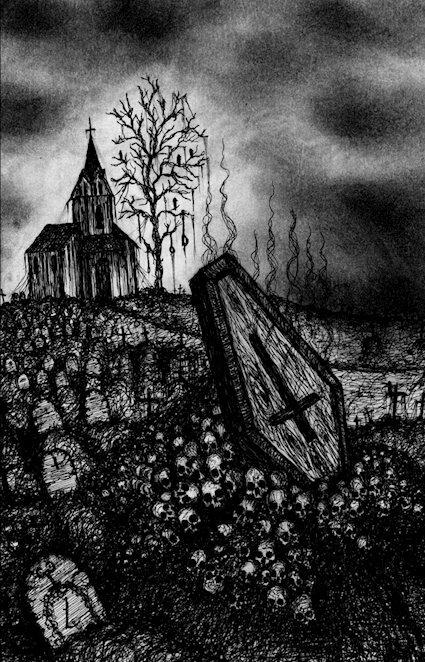 Be it Corpus Christii or IRAE, both musicians are able to, in each of their manifestations, present us with differentiated visions – and sounds – of Black Metal. Released in 2018, the Demo “…Somos o Fogo do teu Inferno” showcases the band doing, throughout its 4 tracks – sang in Portuguese – what they do best: Black Metal. Slow, yet Commanding. Harsh, and always Negative. We can encounter mid-paced moments and aggressive vocals, that either growl or whisper, always giving the listener the feeling of despair and fear. Shouts of desolation acompane the melodies shaped by Vulturius’ guitar… NH’s drums set the pace for what is to come. A bit like the LLN – and mostly Mütiilation – I always see myself pick MI whenever bad things seem to hit my door, per se. It has always felt like Depression. A moment so hard that you feel helpless, but unable to stand and walk… you stay there, breathing. MI has always sounded like the soundtrack to those moments where you feel down, and a bit like Joy Division, they ressonate in a way I believe they wish their music should: Desolation and Despair.